Raise money while you laugh and have a great time. Friday 9th March see’s the charities first ever “Comedy Night” and includes an impressive line-up of regulars from the Comedy Club circuit. But the night doesn’t stop there, Music from the amazing James Taplin and VIP tickets available that include: Meal, waitress service and 2 drinks of either beer or bubbles. Then the night will finish off with a Disco. 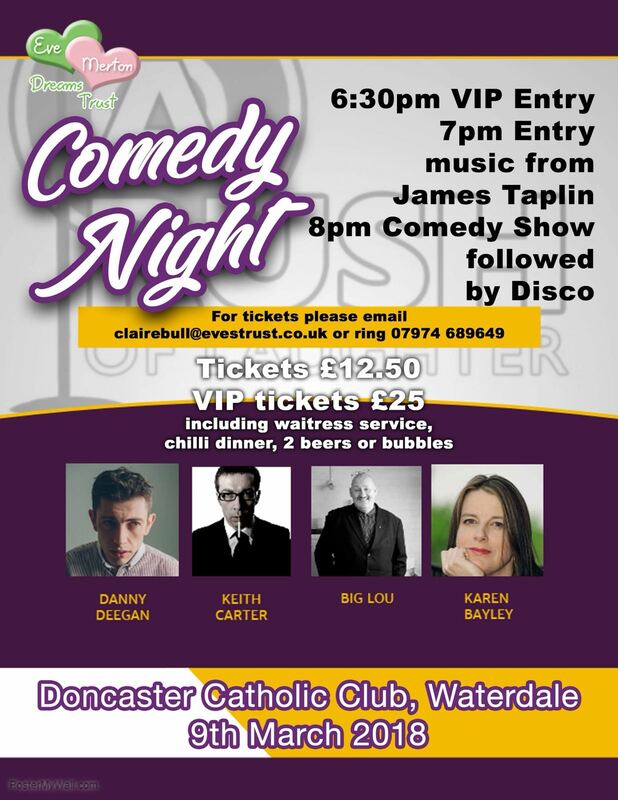 The event will be held at the Doncaster Catholic Club (supporters of EvesTrust) and doors will open from 18:30. For tickets and information, including seating, please email: clairebull@evestrust.co.uk or call 07974 689649. (Pricing as seen on the event poster below) we will also be posting YouTube links for the comedians in the comments section.